Originally designated MV Charles A. Ranlett, a Maritime Commission type (N3-M-A1) hull to be built under Maritime Commission contract (MC hull 652) at Penn-Jersey Shipbuilding Co., Camden, N.J. Declared surplus by the US Army, returned to the Maritime Commission, 27 August 1947, for lay up in the National Defense Reserve Fleet, James River Group, Lee Hall, VA.
97k USAPRS Joe C. Specker at anchor, location unknown. Bow horns for lifting diving and salvage equipment, and plenty of machine shops ultimately made these ships useful to the Army. US Navy photo from the U.S. Naval Institute. 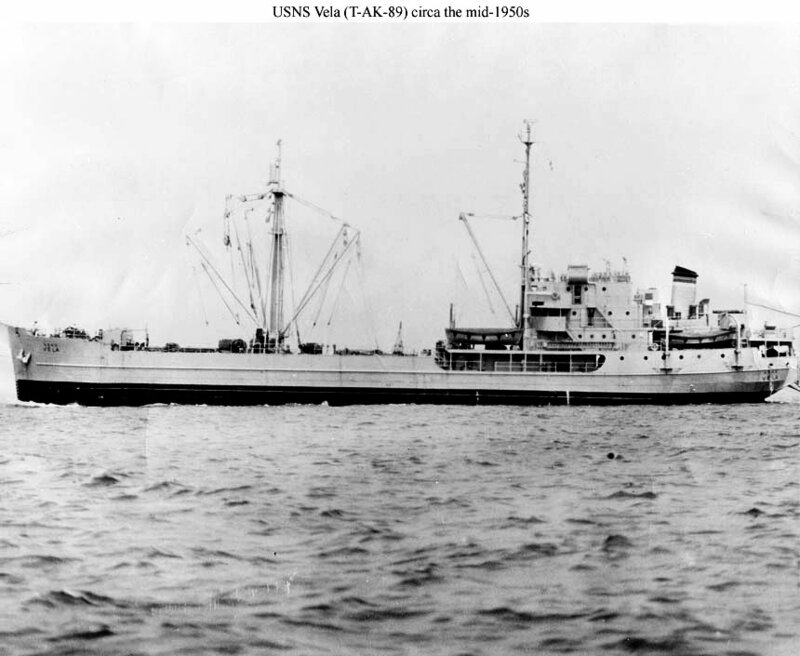 82k USNS Vela (T-AK-89) underway circa mid-1950s in MSTS service. She was similar in appearance to USNS Sagitta (T-AK-87), except that her Army cathead had been removed.